The technical term for a work of art that contains itself, or something like itself, is mise en abyme. (Literally “to place into an abyss,” but commonly translated as “mirror in the text.”) A painting of people posing for a painting (or even containing a curtain in one corner) is deploying mise en abyme. A story that contains the telling of stories within it—from Boccaccio’s Decameron to Don Quixote to the works of Jorge Luis Borges and Paul Auster—is deploying mise en abyme. The films of Charlie Kaufman, such as Adaptation, tend to deploy mise en abyme. Stephen Colbert’s portrait, which features him standing in front of a smaller portrait of himself which features him standing in front of a still-smaller portrait of himself, is deploying mise en abyme. And a dolphin on a football helmet who himself wears a football helmet is a deployment of mise en abyme. When the Miami Dolphins play the Saints in New Orleans Monday night, the wider public will be introduced to the new Dolphins logo, which is the first to substantially break from the one introduced when the team debuted in 1966. 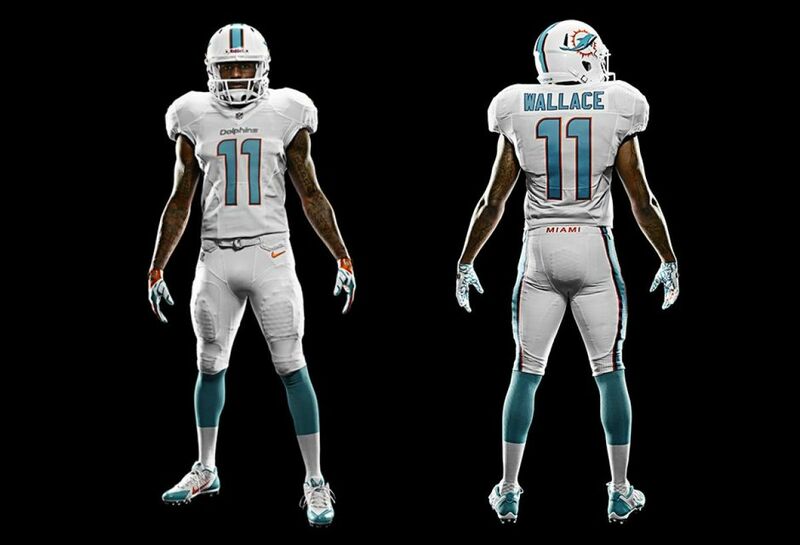 Though the Dolphins have had four previous logos, all contained the same basic template: an aqua-colored dolphin, looking as though he has just left the water on a jump, in front of an orange circle and wearing a football helmet (albeit one without the customary facemask.) Extremely notably, this helmet was white with an orange “M,” for Miami, on it—it was, in other words, not the same helmet as the helmet on which it appeared. By contrast, in the new logo, the orange circle and the dolphin remain, but the dolphin is now more horizontal, looking as though he is about to jump, and, more importantly, the helmet is gone. The old logo, with helmet. This is disappointing—and not only because, with every week seeming to bring new revelations about the deleterious effects of football-related head trauma, the dolphin should really be wearing a helmet. For the past half-century the Dolphins have had the most compelling logo in professional sports. Stars like Larry Csonka, Dan Marino, and Reggie Bush have been Dolphins wearing helmets with dolphins wearing helmets—different helmets. It was, in short, gratuitously weird, a vestige of the implicitly countercultural, indelibly 1960s-tinged American Football League where it started. The AFL began play in 1960 after the NFL did not let oil baron Lamar Hunt have his own team. The league was self-consciously funky, with a looser style of play that included—thanks in part to a slightly differently shaped ball—a good deal more downfield passing. It was the league of Sid Gilman’s deep-throwing San Diego Chargers and the vertical offense of Al Davis’ Oakland Raiders. And it was cooler than the stodgy NFL—argyle endzones, “Broadway” Joe Namath, great logos. The original Buffalo Bills logo is a minimalist marvel; Pat Patriot, in tri-cornered hat and Revolutionary War irregular gear, adorned the helmets of Boston’s (later New England’s) players. The Dolphins were the ninth AFL franchise, and the only one founded after the league’s inception but before its historic agreement to merge with the NFL. They were, in other words, the literal last gasp of the AFL’s independent spirit. The new logo, sans protection. Technically the dolphin could be female, but since all Dolphins have been male and the dolphin is supposed to represent the Dolphins, I am going to assume it is a male dolphin.